With the recent Arctic weather, you may be forgiven for thinking that the survey season is a comfortable distance away; however, nature starts to wake up earlier than you might think. We are now into March and all thoughts turn to amphibians and reptiles. In a couple of weeks’ time, British reptiles and amphibians will have started to increase their metabolisms, come out of their dormant period and start looking for food and potential mates. It is during early spring that great crested newts first put in an appearance in the ecological calendar. March signals the start of great crested newt (Triturus cristatus) breeding season, where they end the terrestrial phase of their year, clamber out from their refuges and enter their aquatic phase to breed. The UK also supports smooth newts (Lissotriton vulgaris), palmate newts (Lissotriton helveticus) and a small number of introduced alpine newts (Mesotriton alpestris). The great crested newt, however, is the only newt species protected by law. It is during this time of year that we are able to survey great crested newts, as they are all concentrated in the same place (ponds). 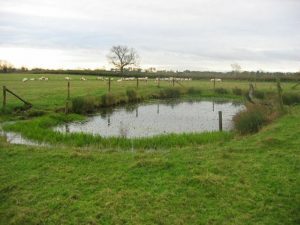 Great crested newt is a protected species and as such, there are specialised survey techniques designed to cause them as little disturbance as possible. The most common methods used are torching and bottle trapping. Powerful, 1,000,000 candle power hand torched are used at night. They are shone into the pond where, with a keen eye, individual newts can be counted and sexed. A little trade secret is that male great crested newts have a silvery stripe on their flanks, which reflects the torch light like a cat’s eye on a road, making them clearly stand out from other species and their female counterparts. More often than not, torching is the first line of survey, followed by bottle trapping. A bottle trap is simply a fizzy drinks plastic bottle with the top cut off and inverted (small holes are added in the base to allow water to flow through). The bottles are attached by elastic band to bamboo canes and set out (partially submerged) in the pond at a decent depth, 2m apart from each other for the whole perimeter of the pond. The traps are put out last thing at night, and then collected back first thing the next morning to ensure that any newts are not confined in the bottles for too long. As they are collected, any trapped newts are recorded and released. The data is then combined with the data from the torch surveys to ascertain either a presence or absence, or an estimated population count. All activities concerning great crested newt must be carried out by licenced individuals. With the exception of the smooth snake (Coronella austriaca) and sand lizard (Lacerta agilis), you do not need a special licence to survey reptiles in the UK. 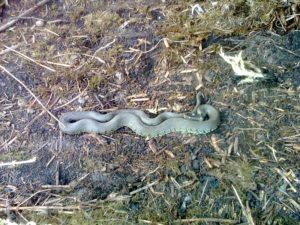 Towards the end of March, reptile surveys can be set up. A survey is set up by cutting lengths of bitumen roofing material into squares of 50cm each. The mats are black, which therefore heat up faster than the surrounding area. This encourages reptiles to use them to bask on, or underneath. The mats are then laid out in rows and columns, in sufficient quantities across the area to be surveyed, allowing at least 10m between mats. The mats must be left out for a minimum of 2 weeks before the survey itself can begin. This is to allow time for reptiles to find and utilise these temporary “refugia”. Once set, a series of 7 surveys are conducted, where each mat is carefully lifted in turn, to see what, if anything, is lurking underneath. Once the 7 surveys are complete, the numbers of individuals of each species are recorded and a population estimate is calculated from them. The most common find under these mats are ants; they thrive in the warm, dark habitat the mats create. If you are lucky, you may find one of our snake or lizard species. 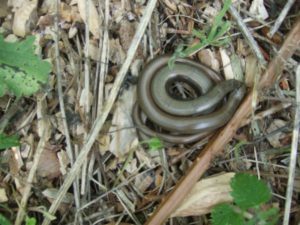 Slow worms (Anguis fragilis) and common Lizard (Zootoca vivipara) are the most frequently encountered reptiles as a whole, but depending on the site, grass snake (Natrix natrix), adder (Vipera berus), or possibly even protected sand lizards or smooth snakes can be commonplace. Remember, if you need great crested newt or reptile surveys undertaken for your project, make sure you book them in as soon as you can. Ecological consultancy calendars can get quite full at this time of year!